TriTek is a broad-spectrum fungicide, instecticide, and miticide. It is a reverse emulsion formulation with the consistency (and look) of liquid yogurt. The reverse emulsion process allows it to break into a very small droplet size when sprayed as part of a foliar mixture. This allows for a more complete and uniform coverage of the plant surface. It is often used in conjunction with Brandt Ecotec Plus. 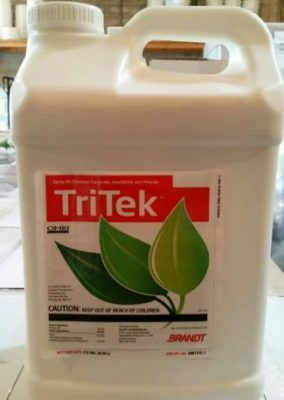 Brandt TriTek is made with a reverse emulsion process that allows this oil to mix very easily with water in the spray tank. Small droplet size greatly enhances plant leaf surface coverage. Zero days to harvest, 4 hour reentry interval.